Sunday Morning Worship Service ( LIVE Broadcast) Service Schedule Sun, Prayer 9:00 a.m. Sunday School, 10:00 a.m. Choir Rehersal 3:00 p.m. Morning Worship, 11:30 a.m. Mon-Morning Prayer, Mon-Fri. 6:00-7:00 a.m. Men's Fellowship, 7:00 p.m. Tues. Moving to Ministry, 6:00 p.m. Wed- Food Bank Ministry, 11:00-3:00 p.m. Bible Study, 7:00 p.m. Fri- Praise Service, 7:00 p.m. Sat- Moving to Ministry, 9:00 a.m. Whether speaking at a revival, conducting a seminar or leading a community outreach program, Bishop James Darrell, Robinson, Sr. has dedicated his life to the ministry and serving others. Bishop Robinson made this commitment to souls in July of 1975. It was a Saturday afternoon upon praying for hours when he received the call to preach. As a young man, an earnest spirit was instilled which has kept him steadfast on the faithful path the Master would have him follow. Bishop Robinson took his first trip abroad to minister on the islands of Jamaica and Bermuda. He continued to evangelize by conducting revivals across the country, under the supervision of Bishop Robert T. Robinson. He was led to become Pastor of the Federalsburg Maryland Revival Temple for 3 years. He returned to Philadelphia in 1986 to pastor the Philadelphia Revival Temple Church where he remained for 12 years. 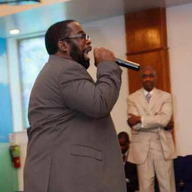 During this pastorate with the Philadelphia Revival Temple Church he was inspired to form The Ruwach United Fellowship, Inc. Ruwach means “the wind of God, or the breath of God.” This organization was formed on the basis that independent churches should unite, dependent on God’s divine leadership and soul winning ministries.